Cleanup! I hate cleaning but I do love a clean and organized house, but sadly I struggle in keeping my home clean and organized. One of my major problems is my closet. I'll spend a whole day cleaning and after a few days its back to looking like my closet and drawers exploded! So, one of my goals this year is to cleaning up and organizing every room in this house.....and keep it clean and organized! I decided to start with my closet. It was a disaster, but since its the smallest room and where I store the bulk of my things, I thought it be the best room to start! Yea - it was a mess - nothing was where it should be and I had piles & piles of stuff! Clothes, bags, shoes and just stuff all piled all over each other! I took one day on the weekend and started early. I took everthing out and dumped it on my bed - this helped me sort through everything. Little by little I started bringing things back into the room. It was a long process and by the end of the day I was exhausted but I was very happy that I got it done! I do everything in this room - get dressed, do my hair & make up. Aside from all my husband's and my clothing, shoes, jewelry and makeup, I also store my handbags, bed linens, books, extra toiletries and travel stuff in here. This was actually an extra bed room that I used to use as an office but then decided that I needed a closet more than an office...so voila!! A closet it is. As long as I keep it clean and organized its a great closet/dressing room - I love it!! I only hope that the day we move, we find a place with an extra room that I can convert to a closet like this - or better! 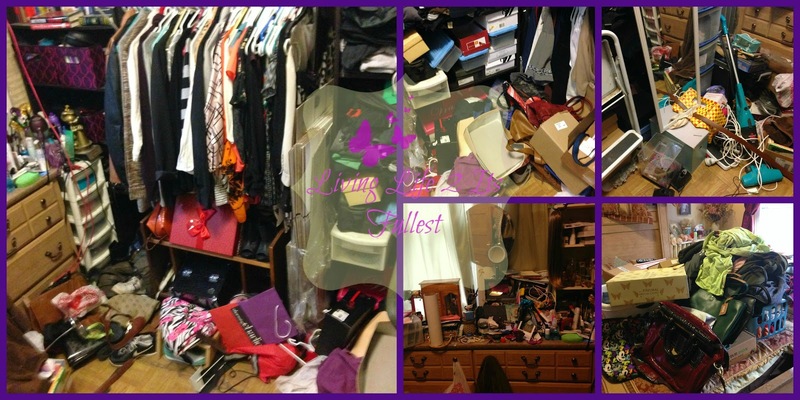 Would love to hear from you - do you keep your closets neat & organized? Is it hard to maintain it organized?